Behind the sticker-covered door of a nondescript building in Brooklyn, a startup is working on what it hopes will be the future of news. Behind the sticker-covered door of a nondescript building in Brooklyn, New York, a startup is looking to sell the public a stake in a new business model for the old profession of journalism. The model is based on blockchain, best known as the technology behind bitcoin, the virtual currency. But blockchain — the term used for a digital system in which various computers all contribute to a secure, permanent and public ledger — has many more applications than a speculative currency. Supporters believe the power of blockchain could help spur a new wave of businesses and organizations, just as the internet itself has changed commerce and the flow of information. And one of the industries that could be affected is journalism, which has been damaged in recent decades as the internet took away the monopolies of traditional news outlets. One of the first companies to push that change is a Brooklyn startup called Civil Media, which launched an ambitious plan last week to jumpstart what it hopes will be a new journalism economy capable of sustaining a fresh generation of media startups at a time when news outlets new and old are facing a difficult future. Civil’s goal is to help news outlets raise money from readers and investors while also providing tools to monetize journalism. Additionally, readers who have bought Civil’s cryptocurrency tokens, CVL, can “vote” on whether a news outlet is doing its job well, and in an ethical way. 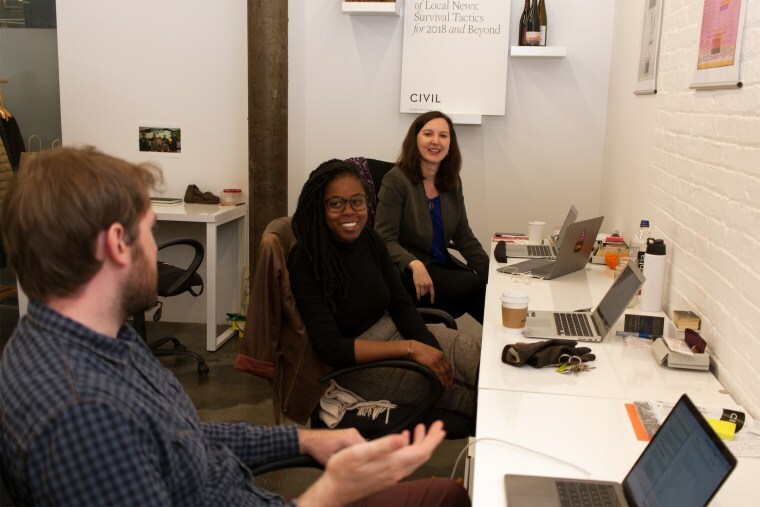 “What we're doing with Civil is trying to build a platform that exists for the sole purpose of promoting ethical journalism, of being a home for the independent network of individually owned and operated newsrooms,” said Matt Coolidge, a co-founder of the company. The building that Civil occupies in the Bushwick section of the borough is shared by a variety of startups that are part of ConsenSys, a company that is betting blockchain technology — in particular, a blockchain system known as Ethereum — will herald a new era of innovation. Civil’s goal is to use Ethereum to create a platform that will form a more direction connection between the work created by journalists and the value it creates for readers. As Google, Facebook, Amazon and Twitter take in billions of dollars in ad revenue that might otherwise go to news outlets, the U.S. media industry continues to endure layoffs and closures. ConsenSys, which was founded in Oct. 2014 by Joseph Lubin, who also co-founded Ethereum, funded Civil in October with $2.5 million in cash and an additional $2.5 million in services. ConsenSys currently incubates more than 40 startups aimed at creating a variety of businesses on Ethereum including online poker, legal agreements and advertising technology. There are a variety of different blockchain applications, including Ethereum, which has been lauded for “smart contracts” that can automate a wide variety of interactions. Civil is built on Ethereum, using the system for a variety of its service offerings including a way for newsrooms to receive money for licensing their content and a system to ensure newsrooms are acting ethically. Civil isn’t the only startup looking to use blockchain technology for journalism. Po.et, founded in February 2018, has a similar mission. “The path Po.et is taking toward digital artistic independence can free not only content creators but media companies, brands and marketers from servitude to particular platforms, publishers and revenue models,” wrote Po.et CEO Jarrod Dicker in a blog post. Central to Civil’s mission is what’s known as a token, which is a specialized digital currency within Ethereum. In a blog post, Civil CEO and co-founder Matthew Iles compared its CVL tokens within the Civil system to the U.S. dollar within the U.S. economy. To kickstart that economy, Civil opened the sale of its CVL token on last week, offering up $24 million worth. Aspiring token holders, who must pass a test, also need to commit to contribute to and regulate ethical journalism on the platform. The tokens are meant to create a shared community responsibility between all of Civil’s publishers as well as readers and anyone that's part of the media industry. Newsrooms must stake $1,000 in CVL when applying to be on the Civil registry and adhere to a set of journalistic ethics codified in a document called the Civil Constitution. Token owners who believe that an existing or prospective newsroom violates those values must also stake $1000 in tokens to challenge its ability to appear on the registry. Then, token holders vote on the challenge. If the newsroom is rejected, it loses its deposit, which is split between the challenger and the token holders who voted to reject it. If the challenge fails, then the challenger’s deposit is split between the newsroom applying and the token holders who voted to accept it. This process provides an economic incentive for CVL token owners to protect the integrity of journalism on the platform. Civil has already signed partnerships with the Associated Press, the Annenberg School for Communication and Journalism at the University of Southern California, and the European Journalism Centre, among others. The company also has some burgeoning news outlets including The Colorado Sun, started by journalists laid off from the Denver Post, and Cannabis Wire, which covers the marijuana industry. Civil’s token sale comes as the future of the news media remains in doubt. As layoffs continue to hit newspapers and media organizations across the U.S., digital upstarts have sprung up in hopes of finding new models that can sustain journalism. Falling cryptocurrency prices — Ether, the cryptocurrency of Ethereum, has declined significantly in recent months — have tempered some optimism for blockchain applications, but investment is still pouring into blockchain startups. “Although cryptocurrency markets are down... [venture capital] funding to blockchain startups is way up in 2018, with over 225 deals totaling more than $2 billion so far this year,” said Arieh Levi, analyst at startup investment tracking firm CB Insights, in an email. Ben Jones, an independent blockchain researcher, said Civil’s experiment belongs to a particular class of blockchain applications known as “token curated registries,” which can provide an economic incentive for token holders to curate information and hold other parties accountable. He said that token curated registries are still a relatively new phenomenon, but one that he thinks has serious potential.